Textechno won the JEC World Innovation Award 2016 for a new testing system to access the properties of a fiber to matrix interface. 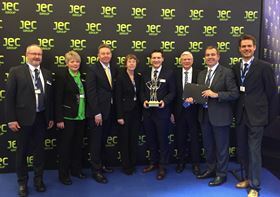 Textechno, a German manufacturer of testing equipment for textiles, and the Leibniz Institute for Polymer Research Dresden, have won the JEC World Innovation Award 2016 for a new testing system which can access the properties of a fiber to matrix interface. The quality of a composite laminate, especially the stiffness, can be dependent on a good adhesion strength between the reinforcing fiber and the polymer matrix. To accurately and reliably measure the bonding between fibers and resins, Textechno developed Fimatest, the first system that is commercially available consisting of two devices Fimabond, a partially automated embedding station suitable for all fibers and resins systems, and the pullout tester Favimat+, which can also be used for single filament linear density and tensile testing. The first system has been delivered to the new Fraunhofer ICT Institute in Augsburg, Germany and another unit has been sold to a glass fiber producer in the USA, the company says. This story uses material from Textechno, with editorial changes made by Materials Today. The views expressed in this article do not necessarily represent those of Elsevier.